An Istanbul prosecutor launched investigation against journalist Ismail Küçükkaya and lawyer Fidel Okan for implying that the family issues minister Fatma Betül Sayan Kaya’s husband used the controversial mobile app, ByLock, on Tuesday. Küçükkaya and Okan tweeted on Monday that Kaya divorced her spouse after she found out that he had downloaded the ByLock app. To the government, ByLock is a communication tool among followers of the Gülen movement, accused by President Recep Tayyip Erdogan of leading the July 15, 2016 failed coup. Thousands of people including Taner Kilic, the chairman of Amnesty International’s Turkey branch have been arrested over ByLock use so far. 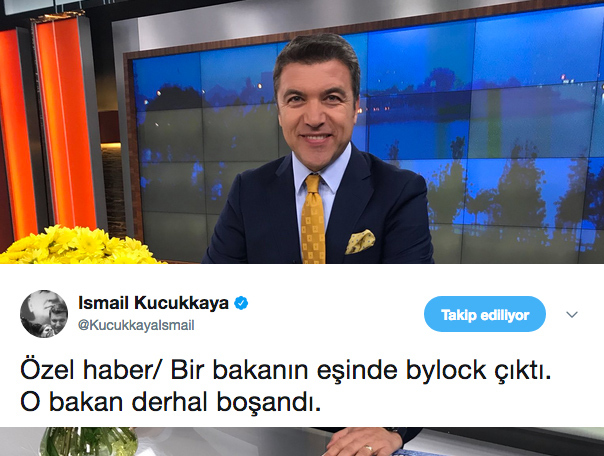 Küçükkaya apologized for tweeting about the minister’s private life while standing by his claim that Kaya’s husband used ByLock.